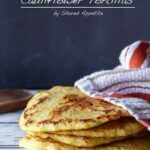 A healthy, gluten-free, and paleo friendly recipe for Cauliflower Tortillas. I have to give it up to our friends Steve and Valerie for this one. They are doing this not-quite-paleo, not-quite-Atkins type of diet where they are severely limiting their intake of carbs and sugars. There’s a name for it… I just can’t think of it. They’ve been dropping all sorts of weight and look fantastic. The only bummer is that sometimes their meals can feel incomplete because the majority of their food intake is basically meat and non-sugary vegetables. But then Valerie was talking about how she made cauliflower tortillas a few weeks ago, which made her super happy to be able to have a normal meal. And then pair that with all the fantastic cauliflower recipes my man Mike over at The Iron You has been pumping out, and I knew I had to get in on this cauliflower action. Especially since I’m working on getting back into the whole operation stop being a fatty thing. These faux-tortillas are a bit plumper than it’s flour and corn counterparts. It’s almost more like the thickness of a gordita at Taco Bell. Mmmm, Taco Bell. I digress. 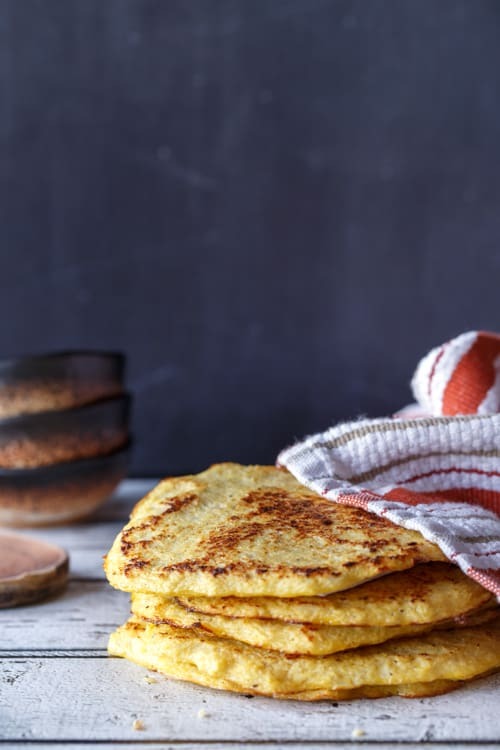 And sure, these homemade cauliflower tortillas are a bit more work than just opening up a plastic package from the grocery store and calling it a day, but it’s worth it. Especially when you consider they are pretty much guilt-free. And anytime I can stuff my face with Mexican food and feel healthy about it… it’s a good day. Chop cauliflower into florets, removing most of the stem. Pulse cauliflower in food processor (in batches if necessary) until cauliflower has the texture between rice and quinoa. Place riced cauliflower in a glass bowl and microwave for 2 minutes, stir, and then another 2 minutes. Let cool slightly, then place cauliflower in a clean dish towel and squeeze out as much water as you can (careful, it will be hot!). Combine cauliflower and eggs in a bowl until thoroughly combined. Season with Kosher salt and freshly ground pepper. The mixture will be a bit runny… that’s ok! Spread mixture into small tortilla-sized circles on a baking sheet lined with parchement paper or a silicone mat (you will probably need two baking sheets). Make sure “tortillas” are fairly flat and even. Cook in preheated oven for 10 minutes, flip with spatula, and cook for 5-7 more minutes. Remove tortillas from baking sheet and let cool on wire rack slightly. Heat a medium sized skillet (I use my cast iron skillet) over medium heat. Place the tortillas, one at a time, in pan and press down slightly with a spatula to slightly brown tortillas. Flip and repeat. This gives tortillas a slightly crisp exterior. These look wonderful! One question though..when you roll them up to eat do they break? Hi Ami, great question! I was worried about that too. If they are completely cold, they will break. However, when they are warmed through, the bend into perfect taco formation without a problem. I actually served these at my annual Cinco de Man-o party (just a bunch of dudes b/c our wives were away at the church’s womens retreat) and they were a huge hit. The guys couldn’t even believe that they were cauliflower! I make my own whole wheat/mesquite tortillas, a flour/corn tortilla, and will soon start making corn tortillas. These sound very good, but they don’t look like they’re designed for burritos or other similar tortilla uses. Do they taste anything like a regular tortilla, and what is the texture like? I may try them when I want a different kind of side dish, but I’m really not sure how one would use them… I understand wanting to decrease unhealthy fast carbs, but this strikes me as going a bit overboard in that direction? I wouldn’t use them for burritos either. However, they are great for tacos. The texture is closer to like a gordita (pita-like). 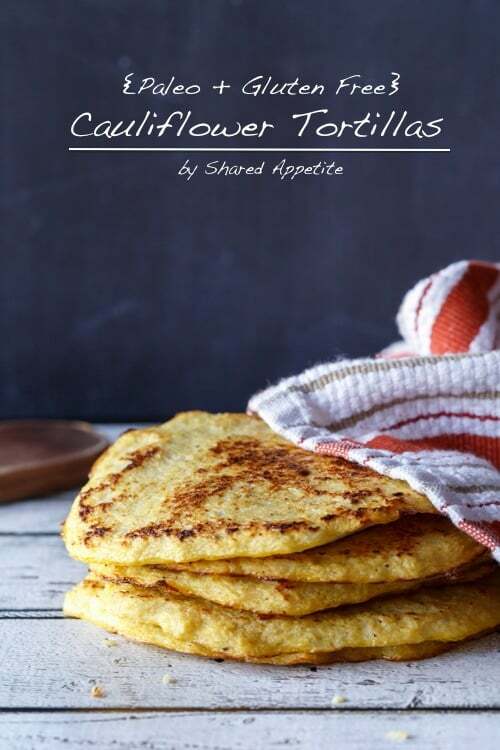 They don’t taste like a flour or corn tortilla… they do taste like cauliflower, but the flavor is mild. If your fillings are bold in the flavor department, you won’t taste the cauliflower. I have some friends that aren’t eating any carbs at all (can’t have flour or corn tortillas), so this is a great option for them to still be able to enjoy tacos and things like that. I had a bunch of them over Cinco de Mayo and they loved these tortillas… mainly I think because they were stuck without a taco outlet for so long.